WHAT IS (SHOULD BE) COPTIC ART? The German Klaus Wessel in his book Koptische Kunst: Die Spätantike in Ägypten (1963) and the French Pierre Du Bourguet in his book L’Art Copte (1964) may argue what Coptic art is, but they fight on Coptic work in the past. It remains for us to decide what Coptic art is now. The minimum requirement in my opinion for a definition of a Coptic art is that it is produced by a Copt – somebody who sees himself as a Copt and defines himself or herself as a Copt; i.e. Christian of Egyptian origin. But is that sufficient? Can any artistic work produced by a Copt qualify for being Coptic? Aren’t the subject and style of visual art important? Here, I use ‘subject’ to mean a representation or reflection of Coptic reality in its various manifestations, either directly, as in a mirror, or filtered through the feelings and emotions of the artist. By ‘style’, I mean the neo-Coptic iconographic style, which we seem to have adopted as the Coptic style. 1. Work produced by a Copt with Coptic subject and style: the great Coptic iconographer, Professor Isaac Fanous Yossef (1919 – 2007), is the most famous artist in this category. He works on religious subjects, and he defined for us the neo-iconographic style, which is followed by his disciples. One example is his Last Supper icon. 2. Work produced by a Copt with Coptic style but no Coptic subject: here I put most of the work of Guirguis Lotfi (b. 1955).One example is El Kabissa. 3. 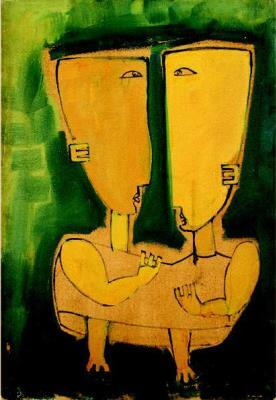 Work produced by a Copt but with no Coptic subject or style: work by Sobhy Guirguis (1929 – 2013) is perhaps the best representative of this group. An example is reproduced below. To my knowledge, work produced by Copts, using Coptic subjects but no neo-iconographic style, are mostly undertaken by amateurs. I have observations on the three categories above, which I share with my reader, but with due respect to the brilliance of the Coptic artists mentioned above (whose work is beautiful at any case). Nothing in the work of Sobhy Guirguis can tell the viewer or critic that it is Coptic: the subjects and style are all “foreign”. But even when Guirguis Lotfi uses the neo-Coptic iconographic style in his work, he rarely depicts Coptic life or reality – his Coptic style is used as a stamp only, as a signiture. Ishak Fanous’ work seems to be the more accomplished from a Coptic point of view – he, however, restrict himself in the straitjacket of the neo-Coptic iconographic style and confines himself to the religious only. I must say, after having recognised the great artistic talent of all modern Coptic artists, that I do believe that Coptic art in Late Antiquity and the Middle-Ages was much freer, more vibrant, colourful, richer and full of vitality, life and colour. Even its subject matter was more encompassing: there were not just religious figures, but portraits of laity, warriors, dancers, animals, birds, plants, etc. The style was particularly freer – what made it Coptic was not any stiff style which often does not relate to reality but the intensity by which it reflects the reality of Coptic men, women and environment. 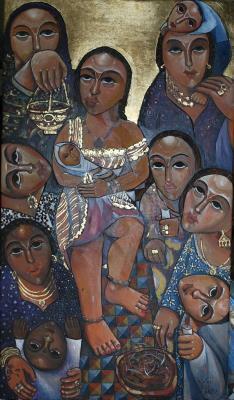 Coptic art must be produced by a Copt – that is, as we have discussed, the minimum requirement. But for an artwork to qualify even more, in my opinion, for the appendage ‘Coptic art’, it must reflect Coptic reality and life, directly or indirectly, in all its manifestations, and must not restrict itself to the religious subject matter or to the neo-iconography style. Coptic art, like Coptic literature, must not rebel against the religious and sacrosanct, as these are important and essential parts of Coptic reality; however, it must widen its horizons and scope, to include the earthly and mundane. It must reflect all aspects of Coptic life, at church, monastery, convent, home, factory, farm, school, university, play, pastime, relationships, and the Coptic environment. Further, it must experiment with all forms of artistic styles. In conclusion, I think Coptic art should be defined, at a basic level, as art produced by Copts, and, at a higher level, as art reflecting Coptic reality. The style must not be restricted to the neo-iconographic. See also, Again: What is Coptic Art? here. Coptic Art by Klaus Wessel; translated by Jean Carroll and Sheila Hatton (London, Thames and Hudson, 1965). Pierre Du Bourguet (1910-1988) was a French Jesuit archaeologist, Egyptologist and historian of early Christian, Byzantine and Coptic art. He was chief curator at the Louvre (Musée du Louvre). Coptic Art by Pierre du Bourguet; translated by Caryll Hay-Shaw (London, Methuen, 1971). For more on this book, go here. This is not to undermine the quality or importance of artistic work done by non-Copts but with Coptic style +/- subject, such as the great work done by the French artist, Dr Stéphane René. I must emphasise that this does not mean criticism of Guirguis Lutfi, a wonderful, innovative artist. It must be borne in mind, too, that some of his work has Coptic subject, such as the brilliant, La Sainte Famille, 2012, and Palm Sunday (2008). See, e.g., the murals at the Monastery of Saint Anthony, here, and at the Monastery of Saint Apollo, here.